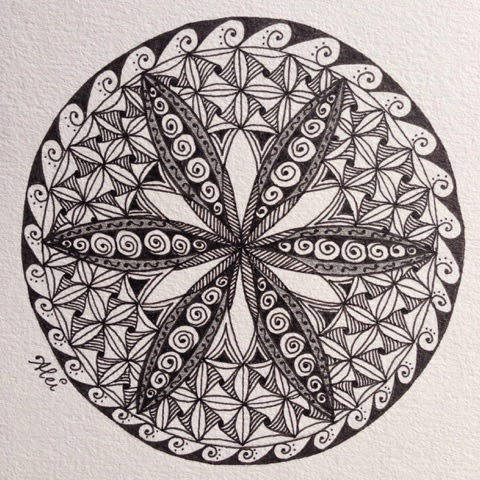 On a lazy Saturday, I was practicing some new patterns and regarding the many beautiful and inspiring examples on the internet. As my daughter was around, she said to me she likes to draw circels - 'it's so fascinating'. So I asked her to draw some circels for me and she made me two drawings. One with random circels, and the other circels-in-circels. Very nice, now I could start to fill them with the patterns. I especially liked a new pattern I learned called Yew-dee, which is another nice variation on Bales. 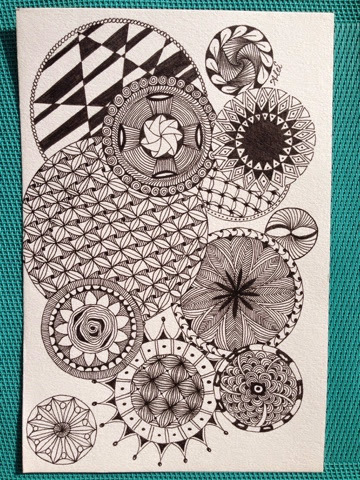 I used it in my two zentangles. Some other patterns I used ard Yincut, Paradox, Chill-on, Phicops, Zazzle, Queens crown, Diva dance etc. Hope you like the results too !